After the big race day was over it was time for Tony and I to make a move. A week earlier, I had received an email from Australian Immigration regarding the application for permanent residency that I had lodged 8 months prior; they needed more documentation from me and they wanted it fast. I was almost out of cash anyways, so with a mixture of regret and relief I made arrangements to get Tony and I out of the canyon and back into civilisation. Our eventual destination: Guadalajara. Ultimately it would take us 12 days to reach Guadalajara, but first we had to get out of the canyon. Tony had done very well in the canyon, but his tires were now completely shot, so we hitched a ride with the “magical Texan girls” – a couple of crazy gals in their early 50s from a small backwards town in Texas: Terlingua – it certainly sounds like an “interesting” place. 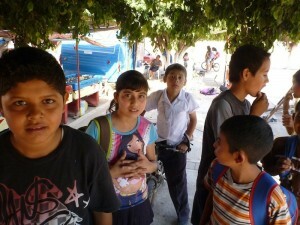 The 5 hour journey from Urique to Bahuichivo was not uneventful. 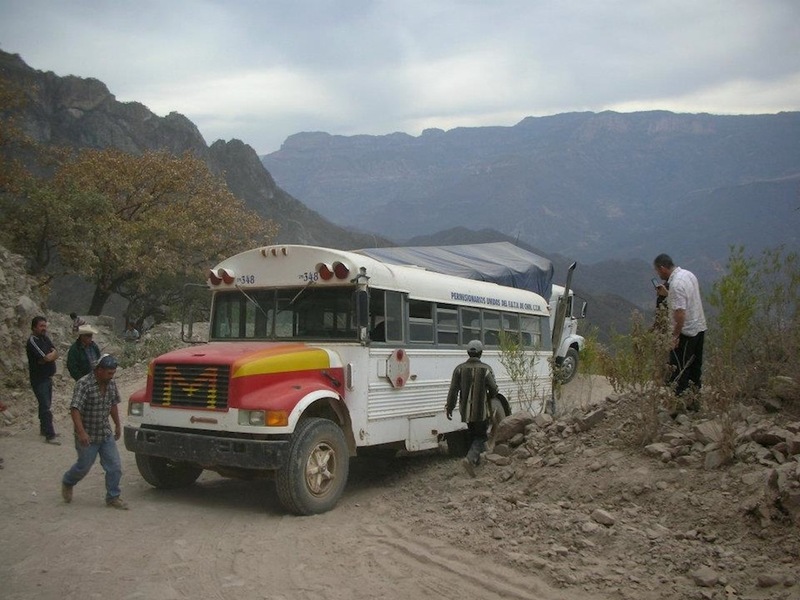 About 2 hours into our journey we came across a stuck truck blocking a bend in the road, for a long moment there we thought we would need to cancel our trip for the day, but then it was decided by the mexican truckers on the scene that we could widen the road instead. So I rolled up my proverbial sleeves and we started moving the larger rocks out of the way to make room for our trucks. It was a tight run, but we managed to get through. I took a siesta on a bench in the Plaza Mayor of a little farm town Guisama, and woke up to find 30 school kids hovering over Tony and I. I felt like Guliver. Once in Bahuichivo, it was the train back to Los Mochis. 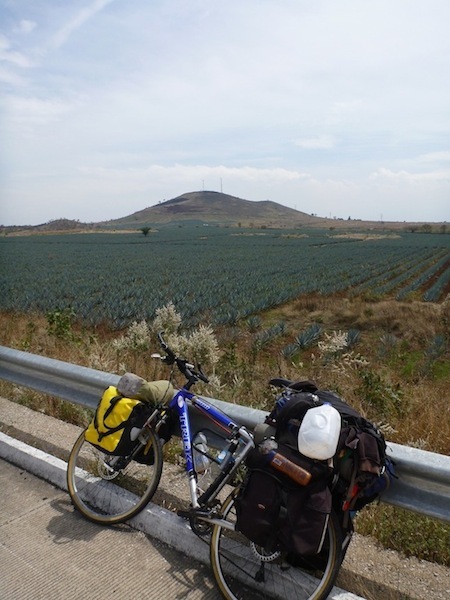 One day in Los Mochis was enough to get Tony some cheap new Mexican tires – for a whopping $10 each – and start handling the paperwork for the Australian Government and the next day “Toño” and I were back on the road and riding for Guadalajara, a mere 900 km away. Bitten by the endurance bug – with a destination and a reason to be there quickly – we smashed this ride. Day 2 out of Los Mochis we set a new record for our longest day by riding over 200 km. As a result, it took us only 3 days to cover the 440 km from Los Mochis to Mazatlan, another record. After a couple of days resting in Mazatlan – a nice enough city with fantastic seafood – we pushed hard and tackled the 5 day ride through intense heat (at one point my thermometer was reading 42C) and serious climbs (see the elevation profile) to Guadalajara. Tony poses in front of the blue agave fields as we passes through Tequila country. I arrived in Guadalajara looking disgusting. My clothes were stiff boards of salt, my legs were covered in grease and “tanned” from an even coating of road dirt, and I smelled liked a mixture of ammonia, deet and compost. But I was alive, and I had made it in time for my birthday. Guadalajara is a huge city, and my first large sized city in Latin America. Just dodging traffic and riding into it I could sense my mental image of Mexico undergoing a change of paradigmatic proportions. This was not the dusty backwater-small town-ranch house-desert Mexico I had spent the last two months sweating away in! This was completely different. This was modern, trendy, cosmopolitan Mexico.